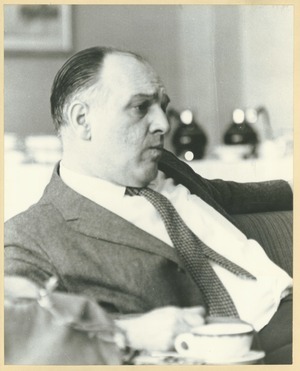 William F. Field was the first Dean of Students at the University of Massachusetts and not only held the post for 27 years, but held it during some of the institution’s most radical growth and maturing, a period known for both student and faculty unrest and activism. Field, a World War II veteran who served as a sergeant in the Pacific, earned a BA from West Chester (PA) State College in 1947, an M.Ed. from Temple the same year, and a Ph.D. in Psychology and Education from the University of Maryland in 1951. Soon after receiving his doctorate, Field began at UMass as a guidance counselor and assistant professor of psychology, becoming the first Dean of Students ten years later in 1961. Perhaps Field’s most powerful legacy as Dean of Students was his handling of campus unrest, specifically during the takeover of Mills House in 1970 and the anti-Vietnam War protests spring of that same year. Since the inauguration of the first CCEBMS class in 1968, black students and faculty on campus had been working with University administration to create a more supportive academic, artistic, safe, and sensitive environment on campus for minority students. When racial violence broke out on campus in February 1970 and the subsequent black student occupation of Mills House, Dean Field worked with faculty and students to not only resolve the unrest peacefully, but helped the crisis become a catalyst to fulfill the earlier demands of minority students and faculty. By- laws, Charters, Constitutions (R.S.O.’s): American Institute of Aeronautics and Astronautics, Inc.
By- laws, Charters, Constitutions (R.S.O.’s): S.W.E. By- laws, Charters, Constitutions (R.S.O.’s): UMASS Junior Branch of the International Food Service Executive Assoc. Inc.
S.A.R.E.O.- Student Employees: Status of Workman’s Comp. Cite as:: William F. Field Papers (RG 30/2 F5). Special Collections and University Archives, UMass Amherst Libraries.